To read the briefing click here. Pour lire en Français cliquez ici. The Democratic Republic of Congo has struck a deal to buy back oil rights from a secretive offshore company for a sum likely to be hundreds of times the price the company paid several years earlier, Global Witness says in a report published today. The contract for the latest sale – in which Congo appears to have made a staggering loss - has not been published, in contravention of the country’s transparency laws. The report shows how Congo agreed the deal with the company Nessergy for a sum probably hundreds of times the initial $500,000 purchase price. Nessergy is linked to Dan Gertler, a controversial businessman who is friends with the Congolese President and the owner of large mining and oil interests in the country. A spokesman for Gertler has firmly denied any wrongdoing in the Nessergy deal, or in any of the other Gertler deals in Congo. The revelations come as Congo’s parliament is considering a new oil law that could help to prevent future corruption by including strong transparency measures. The most recent draft seen by Global Witness, from 10 January, now provides for obligatory tenders for the granting of almost all future oil rights – a measure that, if implemented transparently, could allow Congo to benefit more from the sector. However, corruption risks continue to be high as long as the law fails to include other safeguards, such as the disclosure of the ultimate owners of oil rights. The Nessergy oil deal shares many similarities with a string of secret deals in Congo’s mining sector, where mining rights were bought at knockdown prices by offshore companies and then “flipped” to major international firms for a vast profit. Kofi Annan’s Africa Progress Panel estimates that the Congolese government lost out on at least $1.36 billion in five such deals involving Gertler between 2010 and 2012 – equivalent to almost double the country’s annual spending on health and education combined. Global Witness has raised concerns over these mining deals in previous statements, calling them “potentially corrupt”. The failure to disclose one such deal led the International Monetary Fund to halt lending to Congo in December 2012. The potentially lucrative oil rights were originally obtained by Nessergy in 2006 for $500,000 without a public tender. Although the amount Congo agreed to pay to buy the rights back in 2012 is a secret, Global Witness shows in today’s report that the sum was likely hundreds of times higher. We base this finding on evidence provided by a 2008 contract signed by representatives of Nessergy and H Oil, a company set up by Jacques Hachuel, one of the founders of the commodities giant Glencore. Under the H Oil deal, Nessergy was to be bought for an initial payment of $194 million with potentially more on top. Although that deal ultimately failed because of tensions between Congo and Angola, this price – agreed when oil prices were about half today’s level – gives a good indication of the minimum value of the 2012 sale. An alternative price for the 2012 deal of $150 million has been published in a Congolese news magazine – although significantly lower than the $194 million under the H Oil deal, this would still have been 300 times the amount Nessergy paid in 2006. Under the 2012 Nessergy deal, the Congolese and Angolan state oil companies bought the company and, with it, its rights in oil-rich waters shared by the two countries. This cleared the way for the creation of an oil zone held equally by each country, in which oil majors could be granted rights. Sonangol, the Angolan state oil company, has agreed to pay for Nessergy’s rights in the first instance. However, Congo will eventually reimburse Sonangol from revenues from the block’s future production. Gertler’s spokesman said that the 2012 contract cannot be disclosed because of a confidentiality agreement and that “Nessergy has been instrumental in creating substantial potential value for the people of the DRC”. 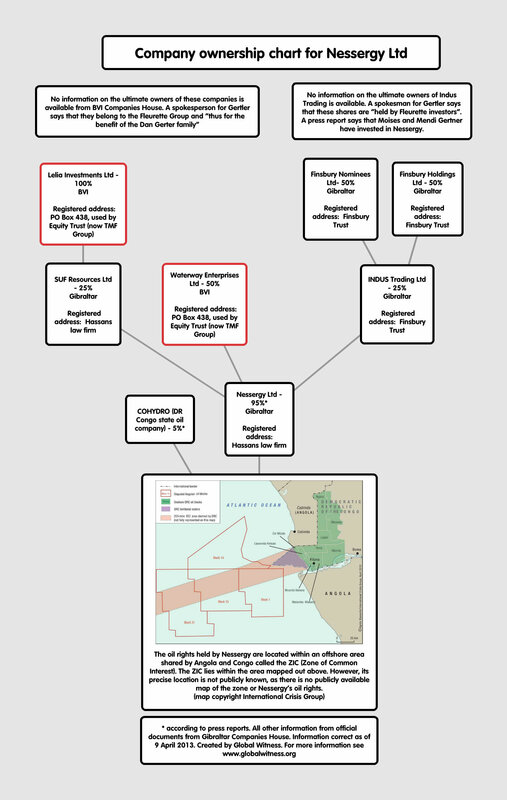 Global Witness also publishes an ownership chart of Nessergy, which shows that it is structured via British Overseas Territories. Nessergy itself is registered in Gibraltar, and is 75% owned by companies registered in the British Virgin Islands, a well-known tax and secrecy haven. Although these companies are all linked to Gertler, the full list of shareholders is a secret, which means it is unclear who ultimately benefitted from this deal. Gertler’s spokesman said that “no DRC politician, official or authorities have any right, legal or beneficial interest in Nessergy whatsoever”. Governments around the world are beginning to take action against corporate secrecy, with the UK having recently announced that it will create a central, public register of the ultimate or “beneficial” owners of UK companies. The government of the British Virgin Islands has launched a consultation on whether to also create a central register of beneficial ownership, including the question of whether this should be public. Global Witness is calling for an end to secrecy over beneficial ownership internationally, as an essential step in the fight against corruption and to allow the citizens of resource-rich countries to scrutinise who is benefitting from crucial deals. As this statement was going to press, Dan Gertler’s Fleurette Group published a statement on the Nessergy deal. Click here to read the statement.